Kinston- Ms. Shirley Graham 81 of 1304 Queens Road Kinston, NC. Transition from labor to reward on March 25, 2019 at UNC Lenoir Healthcare in Kinston, NC. Funeral services will be 11 AM Saturday March 30, 2019, at Jumping Run Church 601 West Rd. Kinston NC. Pastor Alonzo Coleman officiating. Interment will follow in Pinelawn Memorial Park Kinston NC. Viewing 3-7 PM Friday March 29, 2019, at Mills Funeral Home,Inc. 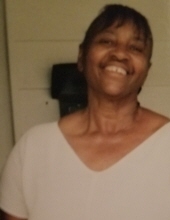 She is survived by daughters Hilda Graham and Sharon Santifer of Kinston; son Kevin Graham of Pensacola, FL; 9 grandchildren; 12 great grandchildren; brothers Frank Graham of Fayetteville, NC and William Graham of Moses Lake, WA; other relatives and friends. To send flowers or a remembrance gift to the family of Shirley Graham, please visit our Tribute Store. "Email Address" would like to share the life celebration of Shirley Graham. Click on the "link" to go to share a favorite memory or leave a condolence message for the family.